Diving trip to the MALDIVES - Week of Chinese New Year - only 3 days off! Ladies and Gents. Do you want to stay in Singapore around CNY? it’s happening again. We are going to the Maldives with Chinese new year! 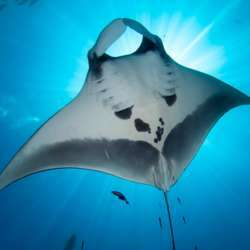 Sharks, Manta rays and February is the best season then. We fly Feb 1st from Singapore to Male in the Maldives where a privat speed boat will bring us to an island about 1 hour from the airport. Here we will stay for 9 nights in a dive lodge and guesthouses and make 18 dives in 7 days. This is not a typical honeymoon destination, more a local island. On Feb 10th we fly back. As you may have noticed for this trip you only need 3 days off on Feb 4th, 5th and 7th, the rest is weekend or public holidays (Chinese New Year). The diving is simply spectacular. The Rasdhoo atoll is a famous dive spot where you can see hammer head sharks, mantas and other spectacular marine life. And February usually means good weather conditions, not waves, sun shine and good visibility underwater. We will make 18 dives. You can also make night dives here, go watch dolphins or go to the beach. This trip is for every dive level - you just need to have an Open Water dive qualification. There are a few deep dives/current dives for which you need advanced but overall a great variety of dive sites for all dive levels. It’s high season and the dive lodge is full but within Protected content walking from the dive center there are a few beautiful guesthouses. If you join, you will be assigned a room mate (ideally same gender) just as we have done on other trips. You will have to take care of your own flights. We leave Friday Feb 1st after work and fly back Sunday February 10th to Singapore. If you need recommendations pls let me know. The trip package is 9 nights in the lodge including breakfast, 18 guided dives, transfers from the airport to the island (speedboat). The price is Protected content per person about Protected content based on room sharing. Trying to find you a room mate, if for any reason we have uneven numbers and you will have to do a single occupancy the price will be higher. Excludes: lunch/diners, insurance, tips, drinks and of course the flights.